Society Lunch 12th May hosted by Fylde Branch Please get your application in by 22nd April 2019. Our Certificate search provides details of certificate donated to the Lancashire Family History & Heraldry Society, which are availale to purchase. "Latest Certificates added on 03/08/2018"
If you have ancestors in Lancashire but are not a member then why not join us and add yours ? "Latest records added on 12/12/2018"
Formed in 1973 as the Rossendale Society for Genealogy and Heraldry (Lancashire), the Society now has twelve branches in Lancashire, together with one in London where members meet regularly. The society also has a worldwide community of family historians with roots in Lancashire. Please check out the benefits of membership for yourself. The area we cover is shown shaded green on the adjacent map. 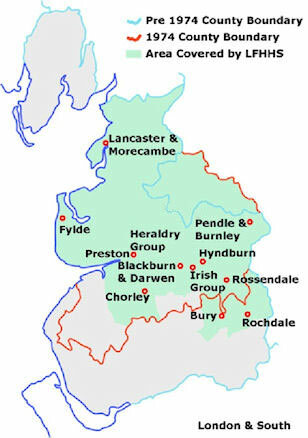 The Society has branches in Blackburn, Bury, Chorley, Fylde, Hyndburn, Lancaster & Morecambe, Pendle and Burnley, Preston, Rochdale and Rossendale. There are branches covering Heraldry and Irish Ancestry. The London and South branch holds joint meetings with members of the Cumbria Family History Society. On joining the Society members are entitled to visit and take part in meetings held by all the branches. Members can use the facilities of any branch, such as its library, holdings of microfiche and CDs. Some branches have fiche readers that can be borrowed for use at home. Each branch organises its own programme of events and activities. Details of these, together with locations and meeting timetables, can be found in the Branches section of the website and in the Society Journal. West Drive, Cleveleys FY5 2BL. the form and sending it to us with a cheque. at Rhyddings Methodist Church, Chapel Street, Oswaldtwistle, Accrington, Lancashire, BB5 3EP. 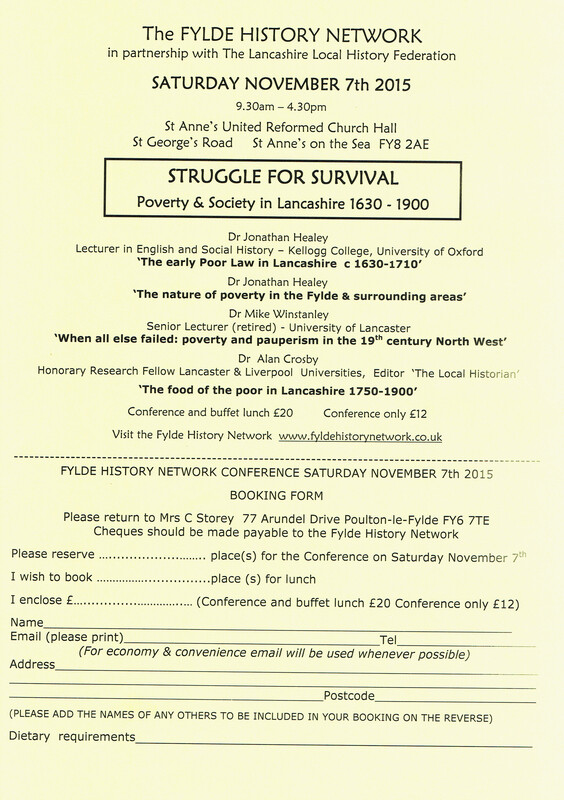 excellent speakers with lunch optional followed by the LFHHS Annual General Meeting.